NOTE: I do not recommend setting a snake trap outdoors. It might catch a non-target animal like a mouse, lizard, or even bird, which is inhumane. Most snakes seen outside are passing through, and best left alone. 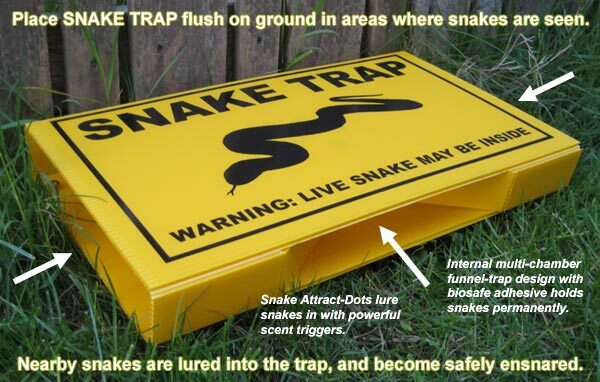 If you have unwanted snakes on your property that you want to remove, or if you just want to trap snakes to observe, the SNAKE TRAP is an effective tool for the job. Just lay it down in the area you have seen snakes - in your garage, next to your house, in the shrubs. Snakes are lured into the trap and become ensnared on the biosafe adhesive inside. The snake is unable to move, and it can then be safely removed from the premises and relocated. We accept PayPal & major credit cards. Click above "Buy Now" link, where you can pay securely with your credit card via PayPal payments, or directly with a PayPal account if you have one. If you want to pay by check, or credit card over the phone, just call us at (we no longer accept phone orders). Shipping is $4.95 USPS Priority Mail same-day shipping. $4.95 flat rate for first trap, each additional trap ships free. Shipping info added during checkout process. Orders ship same-day and arrive in 2-3 days via US priority mail. HOW DOES IT WORK? - Trap is set on the ground, in the area snakes are seen. Snakes enter the trap and become completely ensnared on the biosafe adhesive inside the trap, and are unable to move or escape. WHY DOES IT WORK? - They key is the internal multi-chambered funnel-snare design, and the Snake-Attract Dots, which emit the powerful odor of live mice, and attract the nearby snake into the trap. Snakes naturally seek out enclosed areas, and the design of the trap encourages the snake to enter. DIMENSIONS & DURABILITY: - Trap is 18 inches long x 10 inches deep x 2 inches high. This size has successfully caught snakes up to 5 feet long. It is made of durable corrugated plastic, and holds up in any weather. HOW DO I INCREASE MY ODDS OF CATCHING SNAKES? - The Snake-Attract Dots will help lure the snake in. Set the trap flush on the ground, in areas snakes are seen. 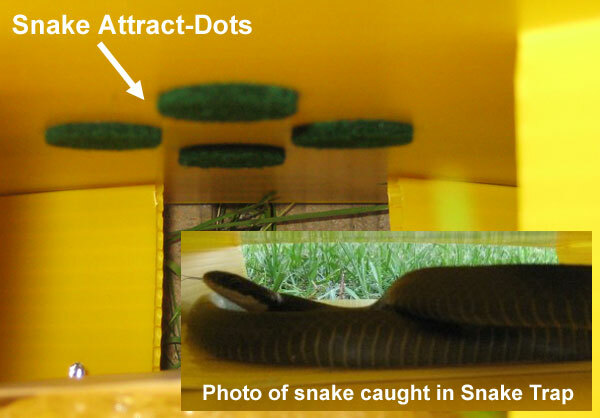 Setting the trap against a wall or other barrier increases chance of capture, as snakes tend to travel along edges. WHAT DO I DO ONCE A SNAKE IS CAUGHT? - The instructions that come with the trap give detailed information on identifying the snake, and then options for relocating the snake and setting it free (easy to do!) or the exclusive Kill-Pad design allows for dispatching the snake. But please don't kill snakes, especially if the snake is non-venomous. You can safely relocate it, and then re-use the trap. Or, if you don't want to do that, call a friend or a local nuisance wildlife control professional for help with the captured snake. NOTE: Do not provoke or attempt to handle any snake that you cannot properly identify - it may be a venomous snake. If you are bitten by a venomous snake, you should immediately seek medical attention at a hospital. Click here for information on venomous snakes - photos and bite advice.